Super easy, this Creamy Stovetop Mac and Cheese comes together in minutes and makes for a delicious main dish or side with dinner. Forget the boxed stuff and make your own mac and cheese from scratch! Beer + cheese + pasta is definitely a winning combination, don’t ya think? Enter this delicious creamy baked mac and cheese —>this one is packed with mozzarella, cheddar, gouda, parmesan and cream cheese for one creamy bite. The beer adds a subtle flavour and sweetness to the mix – definitely comfort food perfect for a cold day. This Pumpkin Mac and Cheese with Kale and Bacon takes only about 20 minutes prep and then you just throw it in the oven for about 30 minutes. What you’re left with is pasta surrounded by a creamy, cheesy pumpkin sauce infused with flavours of cinnamon, nutmeg, clove, smoked paprika and a touch of cayenne. Let’s not forget the hearty kale and crispy bacon. You’re gonna love this one! 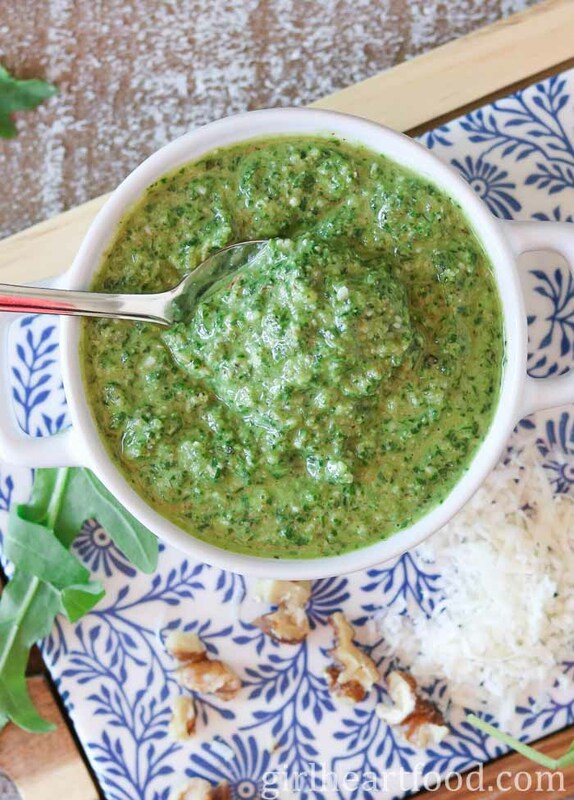 This lemony arugula pesto takes only minutes to whip up and uses a handful of wholesome, simple ingredients. There’s lots of baby arugula, fresh lemon juice, parmesan and walnuts. It’s tasty in pasta, on eggs or even mixed with mayo for a sandwich spread!